I have a confession to make... A confession that may surprise some Montreal-ers. I don't like hockey and I have never watched a full hockey game. Mr. A loves hockey and hardly ever misses a game. In fact, he loves it so much that visiting wedding vendors has become extra tricky nowadays because everything has to revolve around the playoffs' schedule. When Mr. A is watching the game at home, I usually play on my phone (newest game obsession: 2048!!) or am busy in the kitchen. Sporting my lovely Habs t-shirt (a thoughtful gift from Mr. A), I have seen two or three live games. Even surrounded by thousands of hyped fans, my mind wanders and I end up watching the people around me more than I watch the action on the ice. I look at what everyone is wearing, scale their drunkenness levels, give semi-nasty looks to the ones behind me who kick my shoulder surprisingly hard (that happened once), and of course, wait for the cue to jump and cheer when everyone else jumps and cheers. I guess the hockey bug bit me because, to my absolute shock, yesterday was different! I couldn't believe that I was interested in the game in the first period and a little in the second period of the game. My eyes were stuck to the screen like a magnet and the sound effects of the two great men in my life (Mr. A and Bab!) really made watching the game a treat. I cheered loudly when we scored (not as loud as the Misters though), my heart beat quickly when the Bruins were near our net (boo! ), I got angry during penalties... I was a real fan! Like I said, for some reason, the game had my full attention during its first period and mid-way into its second period. I guess the hockey bug that bit me was very small (must have been a hockey-bug-in-training)... or the fact that we had a decent lead made the game less interesting for me... or maybe the thought of putting leftover food away and washing dishes was much more exciting to me (any excuse to be in the kitchen!). Whatever the reason was, I welcome the hockey bug to bite me again! It felt nice to be a member of the CH fan club. It makes me feel like a true Montrealer! 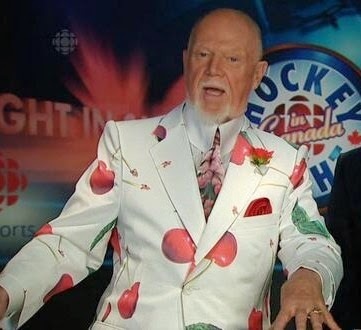 My favorite part of hockey games: looking at what treat-of-a-suit Don Cherry will be wearing. Yesterday was another wonderful gem... Cherry-suit Cherry! In honor of Mr. Cherry and his suit, try this delicious recipe next time you bake! 2. Sift the dry ingredients together. 4. Add the chocolate chips, dried cherries and grated orange peel and mix. 5. Stir in 1/3 cup of milk and add a little more if the dough is too dry. 6. Form the dough into a 1-inch thick disk. Cut into 6 wedges and place on a baking sheet. 7. Brush the wedges with a little bit of milk (and dust with sugar if you want) and bake for 12-15 minutes.